Who knew that your favourite necklace would become your baby’s teething toy of choice? Instead of putting jewellery on hold until your baby has stopped all that grabbing, entwining in little fingers and sucking on anything that they can put in their mouth, take a look at Chewbeads. Chewbeads are made of non-toxic silicon (similar to dummies or the teats on bottles) and are soft on babies gums and emerging teeth. Chewbeads contain no BPA, PVC, phthalates, lead or heavy metals and no detachable parts. If your bub happens to get a little too familiar with your beads, you’ll be happy to know that they can be easily cleaned with soap and water or even thrown in the dishwasher! 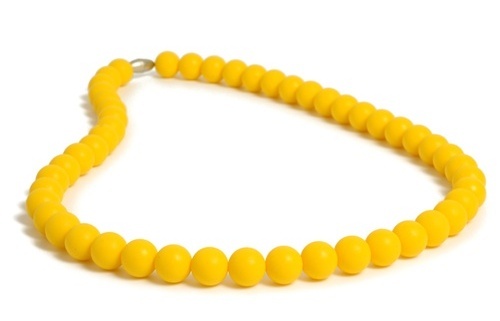 Chewbeads are available in sixteen different colours from bright Sunshine Yellow or Chartreuse to muted Spiced Wine or Stormy Grey. At just US$29.50 a strand, you may even like to layer a few strands for extra effect (and extra teething joy). Also available are Chewbeads bracelets for US$10.50. Chewbeads make a fantastic gift for new mums. Chewbeads ships to Australia on request.